Purchase Agreement: What is it? A purchase agreement is a legal document detailing the specifics of a transaction. This transaction could be for a variety of goods and services, including real estate. This legally binding contract should outline the specific terms and conditions for the transaction. This will ensure both the buyer and the seller know the exact agreements before the purchase agreement is finalized. This type of agreement is legally binding, so it is important to look over the specific terms and conditions before signing anything. Failing to meet these terms and conditions can render the purchase agreement null and void. This could lead to legal disputes between the buyer and seller, so it is important to fully understand the agreement beforehand. Create a free Purchase Agreement in minutes with our professional document builder. Location matters: if you live in a major metropolitan area, your local Craigslist site has exponentially more listings than those in smaller towns. Therefore, if you live in a big city, your post may be pushed below others as newer listings are entered. Use multiple keywords: to avoid having your listing lost in the heap of other listings, use as many helpful keywords as possible. This will ensure that potential buyers have multiple opportunities to find your listing. Set up a new email address strictly for the listing: this will help protect your privacy and ensure that your personal or work email isn’t bombarded with inquiries. Furthermore, junk mailers can scrape email addresses off Craigslist. Using your personal or work email, therefore, leaves you vulnerable to unwanted spamming. Phone call protocol: If buyers ask to speak with you about your listing over the phone, be sure to use a site like Numbr, which provides a disposable phone number you can safely post on craigslist to maintain your privacy. Price your car appropriately: the lower the price, the more interest you will generate. In fact, choosing a lower list price is more likely to generate interest from multiple buyers which increases your chances at receiving your full asking price. Screen buyers over the phone: You shouldn’t feel obligated to oblige every single test-drive request. Doing so is a waste your time. Therefore, compile a list of questions to ask buyers over the phone that will give you an idea whether or not they are seriously interested in the vehicle. Research postings for similar vehicles: This will give you a sense of what the market looks like for a vehicle like yours and help you determine the appropriate price for your listing. It will also give you an idea about how to craft and price your listing to give yourself a competitive advantage. Don’t waste your time: don’t bother with inquiries that don’t seem serious or rude in any way. You should have a good sense of the level of interest of the prospective buyer within the first few sentences. Always choose a safe meeting place: Make sure the place is public and try to only meet during the day. You should also choose a location safely away from your residence so there’s no chance a potential buyer knows where you live. Parking lots near municipal buildings or police station, or near a public strip mall make great potential meeting locations. Bring Documents to Meetings: For example, if your asking price is lower than the Kelley Blue Book value, consider bringing a printout of their price estimate so your buyer knows they are getting a good price. You should also bring all other documents listed above. If the buyer wants to buy the vehicle during the meeting, have them sign the papers and give you a $100 deposit. Close quickly: If your buyer needs to visit their bank to withdraw the requisite cash for the deal, accompany them, if possible. If not, make sure you record all of the appropriate bank information and contact a bank employee to provide further information. *Use the screwdriver to remove license plates while the buyer files forms with the clerk and obtains temporary plates. Be sure to close the listing on Craigslist in order to avoid further inquiries about the vehicle. Inspection: Schedule a car inspection. If you and the buyer arrange to have the car delivered to them, ask them to arrange a remote inspection whereby a mechanic will inspect the car on their behalf. Some states require inspection before a vehicle can be registered, others do not. Regardless, this is the buyer’s responsibility, not yours. Payment: Cash is always best. If banks are open, ask the buyer to go to a bank and withdraw the requisite cash for the sale. If this is not possible, a cashier’s check or money order (made out to you, of course) is your next best option. Paperwork: Documentation guidelines vary for each state. Therefore, make sure you know what forms and documents you need for your state and that of the buyer. Determine if your state requires the buyer to obtain a temporary registration and transfer tags before they drive the car out of state. If temporary registration is required, you can take care of this process at the DMV. Selling your car doesn’t have to be an overwhelming or stressful process. By following the tips set forth in this guide, you can set yourself up for an easy and successful vehicle sale. Our team at FormSwift was interested in determining the cleanest US states in terms of renewable energy use. 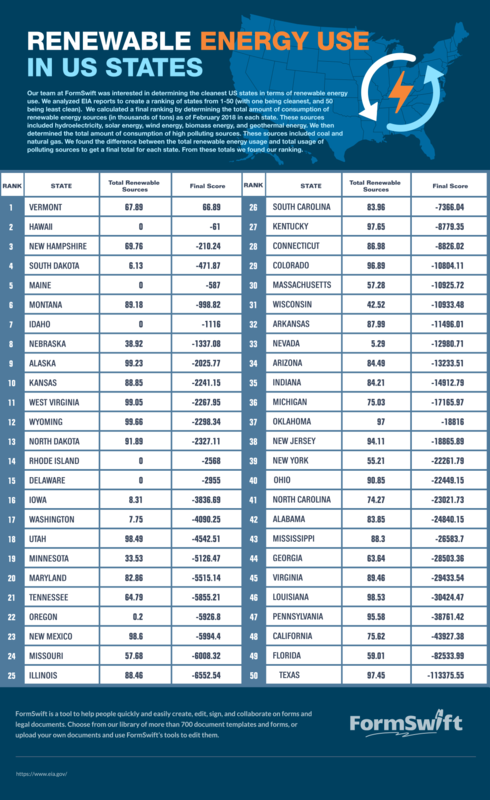 We analyzed EIA reports to create a ranking of states from 1-50 (with one being cleanest, and 50 being least clean). We calculated a final ranking by determining the total amount of consumption of renewable energy sources (in thousands of tons) as of February 2018 in each state. These sources included hydroelectricity, solar energy, wind energy, biomass energy, and geothermal energy. We then determined the total amount of consumption of high polluting sources. These sources included coal and natural gas. We found the difference between the total renewable energy usage and total usage of polluting sources to get a final total for each state. From these totals we found our ranking.